Rex Carver is a fictional Private Investigator created by Victor Canning in the 1960s. 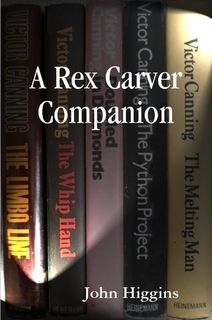 This companion volume to the Rex Carver books describes the four books that Rex Carver appears in: The Whip Hand (1965), Doubled in Diamonds (1966), The Python Project (1967), The Melting Man (1968.) It also describes the book preceding the Rex Carver books, The Limbo Line (1963), which introduces the Government agency that Carver is unwillingly drawn into working alongside. The book also contains an extract of an essay written by Canning in 1960 called The Trouble With Heroes, in which Canning takes a humorous look at the hero and his role and declares that ‘Few authors can be hero-worshippers. That soon goes. But all authors must be hero-manipulators.’ Ironically, five years after writing this, Canning created the sort of hero he had gently mocked – Rex Carver. A Rex Carver Companion also publishes the draft form of a preface written by Canning for The Python Project, which was not used when the book was published. This gives a delightful flavour of Canning as he describes the changing view of the Ashdown Forest that he surveys from his window as he writes the book, starting in spring, through summer and ending in autumn and contrasts it with the exotic foreign locations that he is visiting in his imagination in company with Rex Carver. The five books that Higgins pays particular attention to all feature a Government secret service agency that specialises in dirty tricks, which becomes known as Birdcage because its headquarters are based in London’s Birdcage Walk, and four of them feature Rex Carver, who is the first-person narrator of these books. A Rex Carver Companion is an interesting look at Canning’s writing and a small but significant body of his work, but it is also a fascinating insight into the development of the crime thriller at this significant period of its growth, placing Canning into context with authors such as Len Deighton and Ian Fleming. It is a perceptive book, which shows the development of Canning as a writer, with his dislike for powerful, corrupt organisations, whether funded by the Government or the underworld, and his sympathy for the small, powerless people crushed by their ruthlessness. It also describes how, for the first time he creates a hero who swiftly develops the same amoral attitude to sexual encounters as Fleming’s James Bond. 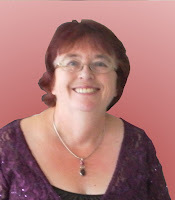 A Rex Carver Companion is a fascinating and very informative book. Between 1963 and 1986 John lived and worked in Thailand, Norway, the USA, Tanzania, Turkey, Egypt and Yugoslavia, teaching. With his wife Muriel, he became involved in CALL (Computer-Assisted Language Learning) and put together a number of innovative pieces of software, including the first versions of a program later released as STORYBOARD, ECLIPSE, RHUBARB. In 1986 John left the British Council and taught in the School of Education of Bristol University. He and his wife are now retired and live in Shaftsbury in Dorset.